This is a quiz that contains NCLEX review questions for bone fractures. As a nurse providing care to a patient with a fracture, it is important to know the signs and symptoms, nursing management for casts and traction, complications, patient education, and treatment for this condition. Don’t forget to watch the bone fractures lecture before taking the quiz. 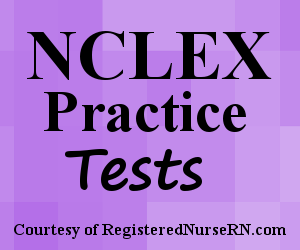 This quiz will test your nursing knowledge on fractures in preparation for the NCLEX exam. A. Cover the fracture with a sterile dressing. B. Place the arm below the heart level. C. Attempt bone reduction by manually readjusting the bone. D. Place a tight compression bandage over the fracture. A. Apply an ice pack covered with a towel to the site. B. Immobilize the fracture with a splint. D. Elevate the extremity above heart level. A. "It is really itchy inside my cast!" B. "My pain is so severe that it hurts to stretch or elevate my arm." C. "I can feel my fingers and move them." D. "I've been using ice packs to reduce swelling." A. Gently moving the cast with the fingertips of the hands every 2 hours to help with drying. C. Checking the color and temperature of the right foot. D. Using a hair dryer on the cool setting to help with drying. A. The weights are freely hanging on the floor. B. Pin sites are free from drainage. C. Patient uses the overhead trapeze bar to move around in the bed. D. Patient’s extremities have a capillary refill of less than 2 seconds. 1. Figure 1 represents what type of bone fracture: This is a fracture that is slanted across the bone shaft. The answer is C. This is known as an oblique fracture. 2. Figure 2 represents what type of bone fracture: The fractured bone is broken into many fragments (3 or more). 3. Figure 3 represents what type of bone fracture: This a fractured bone that breaks through the skin. The answer is B. This is known as a compound fracture (also called an open fracture). 4. You’re caring for a patient who has experienced a fracture to the right arm that is represented in Figure 3. What nursing intervention will you take with this type of fracture? The answer is A. Figure 3 represents a compound fracture (also called an open fracture). Due to the nature of this fracture, the patient is at major risk for infection because the skin is no longer intact. Therefore, the nurse should cover the fracture site with a sterile dressing. NEVER attempt a bone reduction. In addition, avoid a tight compression bandage due to the development of ischemia. Instead, you would want to immobilize the extremities and splint it. 5. A 85 year old patient has an accidental fall while going to the bathroom without assistance. It appears the patient has sustained a bone fracture to the left leg. The leg’s shape is deformed and the patient is unable to move it. The patient is alert and oriented but in pain. What will you do FIRST after confirming the patient is safe and stable? The answer is B. After confirming the patient is safe and stable, the nurse would immobilize the fracture with a splinting device. This will prevent the accidental movement of the extremity by the patient. Immobilization is important because it prevents further pain or bleeding along with more damage that can occur to the surrounding tissues. In addition, if a bone is not immobilized but moved after it has been fractured this can affect the healing process. 6. Which statement by a patient, who just received a cast on the right arm for a fracture, requires you to notify the physician immediately? 7. What is a late sign of compartment syndrome? The answer is D. Pulselessness is a late sign of compartment syndrome. 8. Select all the signs and symptoms that will present in compartment syndrome? The answers are B, D, and E. These symptoms may present with compartment syndrome. Option A and C are normal findings. Remember in compartment syndrome nerve and blood vessel function is being compromised, so expect signs and symptoms that occur when these structures are affected. 9. Your patient is 2 hours post-op from a cast placement on the right leg. The patient has family in the room. Which action by the significant other requires you to re-educate the patient and family about cast care? B. Positioning the cast at heart level with pillows. The answer is A. The cast should always be moved with the palms of the hands (NOT finger tips) during the drying period to prevent dent formation because this can cause the development of ulcers under the skin where the dents develop. 10. A patient sustained a fracture to the femur. The patient has suddenly become confused, restless, and has a respiratory rate of 30 breaths per minute. Based on the location of fracture and the presenting symptoms, this patient may be experiencing what type of complication? The answer is C. Patients who experience a fracture of the long bones (such as the femur) are at risk for a fat embolism. The patient will become confused and restless along with an abnormal respiratory status. 11. Which assessment finding found while assessing a patient with a fracture who has traction requires immediate intervention? The answer is A. Weights used for traction should freely hang but NOT on the floor. All the other options are expected findings. 12. A 5 year old has a fracture of the right upper arm. The x-ray showed that one side of the bone is bent while the other is broken. This known as a __________ fracture? The answer is B. 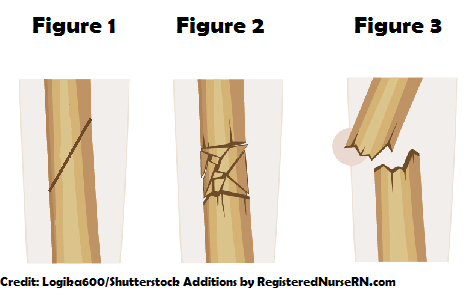 This is a greenstick fracture. These types of fractures are more common in the pediatric population because their bones tend to be more flexible and the periosteum is stronger than an adult.